…to be jolly, falalalala lalalala! ‘Tis the season to give to others: money, gifts, hugs, kisses, love, thanks, or just kind thoughts. ‘Tis the season to celebrate: holidays, love, life. ‘Tis the season to reflect: on what we are thankful for, why we do what we do, or what we want to accomplish over the next year. Really, all of the above should happen year-round. But life gets away from us, and the winter holidays (really starting with Thanksgiving, but culminating for us Americans at New Year’s) are often the only time people step back to take a deep breath and look both back and forward as the year draws to a close and a new one begins. Ukrainians love holidays (свята), both in the sense of celebrations and vacation time. By the end of this week I will have attended at least four parties. 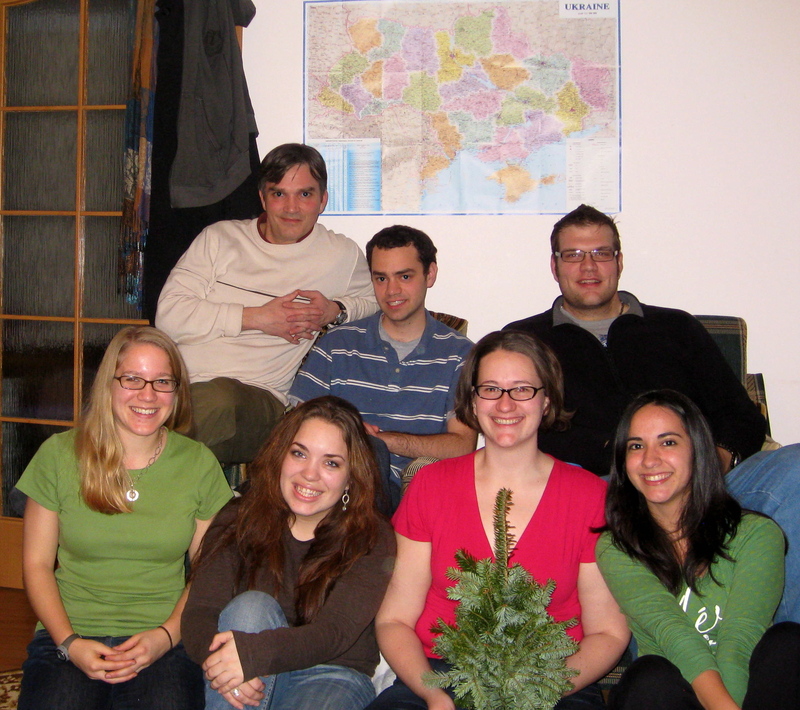 1) For American Christmas (Ukrainians celebrate the Orthodox Christmas on 7 January), six of my “link family” — the people I trained with — came to my apartment for a Christmas slumber party. We cooked dinner, played cards (a Ukrainian game called дурок [“du-rok”], which means fool), talked, watched The Muppet Christmas Carol, and generally relaxed and enjoyed each others’ company. It was a really lovely evening, and the next best thing to being with my real family. I’m thankful to have such great link-mates — we all get along and each person brings something interesting to the table. 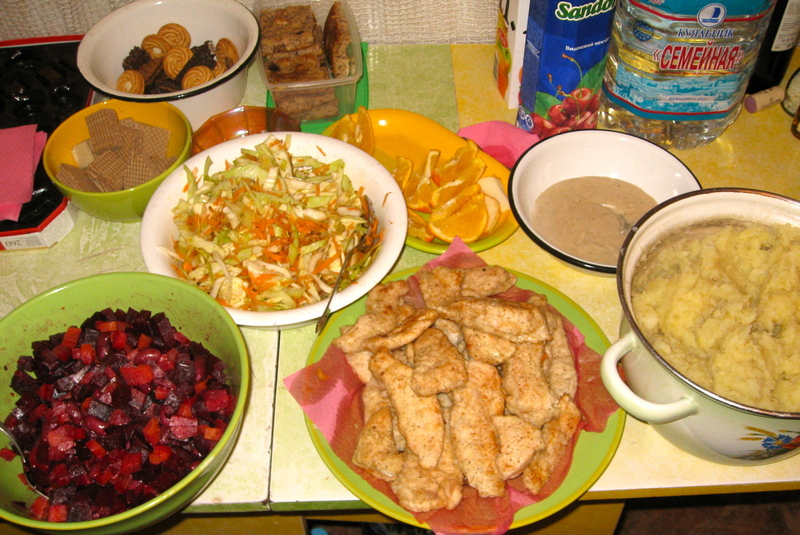 Christmas dinner: beet/carrot salad, cabbage/carrot salad, Michelle’s Texan fried chicken, gravy, mashed potatoes, and plenty of cookies. And that was only the beginning. 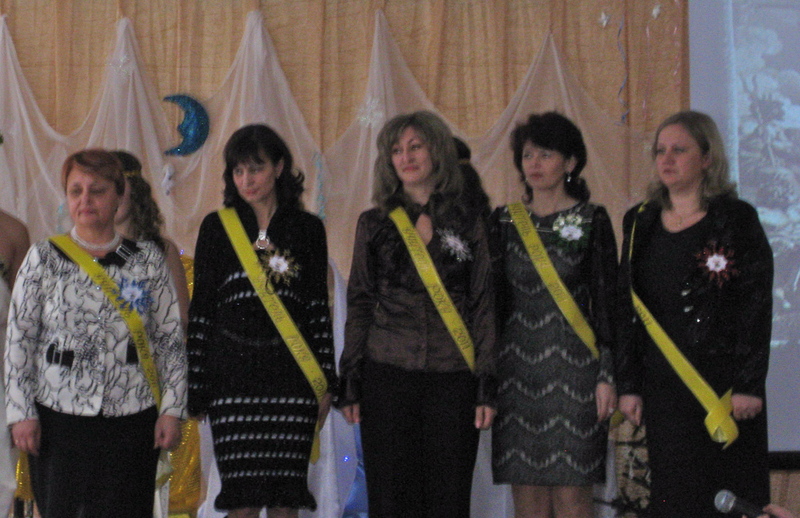 Today (Monday), Janira — my cluster-mate who lives in the village 3km from my town — and I sat through a 2.5-hour presentation/celebration for the Methodological Cabinet’s “Teacher of the Year” awards. 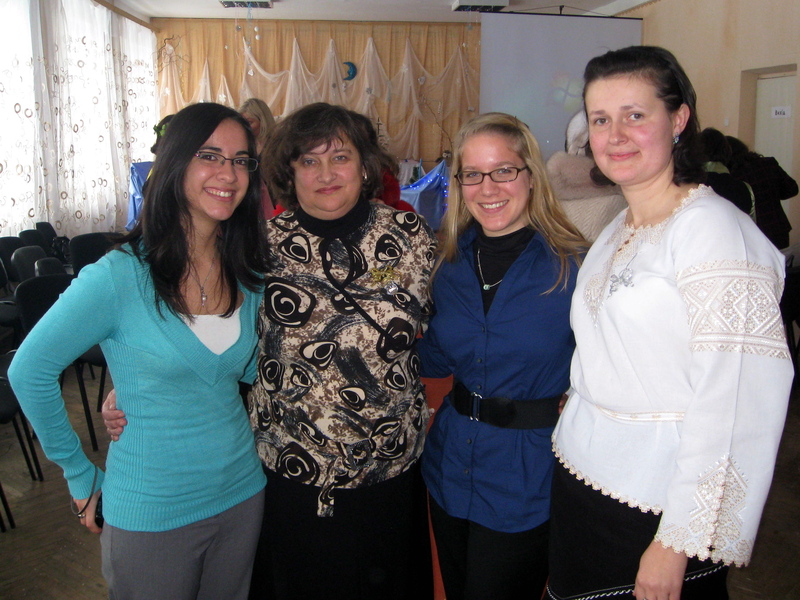 One of the women who works at the Method-Cab also teaches some English at my school, so she invited us. Janira’s counterpart was also in the running for German Teacher of the Year — and she won! The Method-Cab holds competitions in five subjects every year, all of which culminate in this lovely event. This year’s awards were for teachers of history, world literature, German, art, and primary school. The celebration also incorporates the New Year, so there were various performances amidst lots of speeches. Celebrations still to come: my counterpart’s husband’s birthday party (Wednesday), and the teachers’ New Year’s party at my school (Thursday). 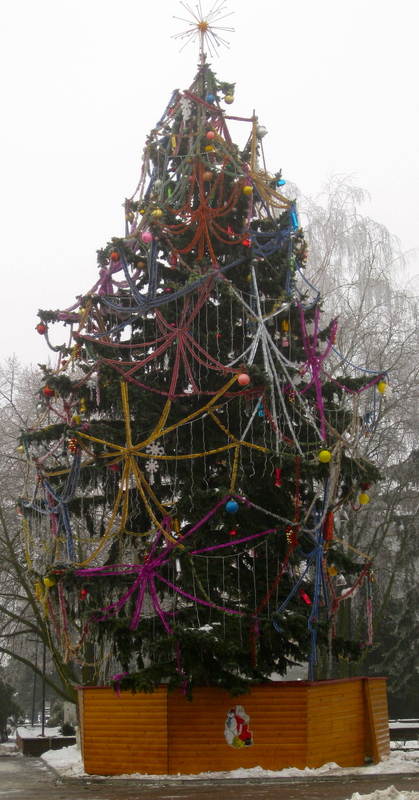 I will also likely do something for New Year’s — I guess the town goes out to the central square near midnight to be together near the New Year’s tree. Since I can’t be home for the holidays, being in Ukraine is a pretty great substitute, since these people love to include everyone in their celebrations. Here’s wishing you all a happy, healthy New Year. 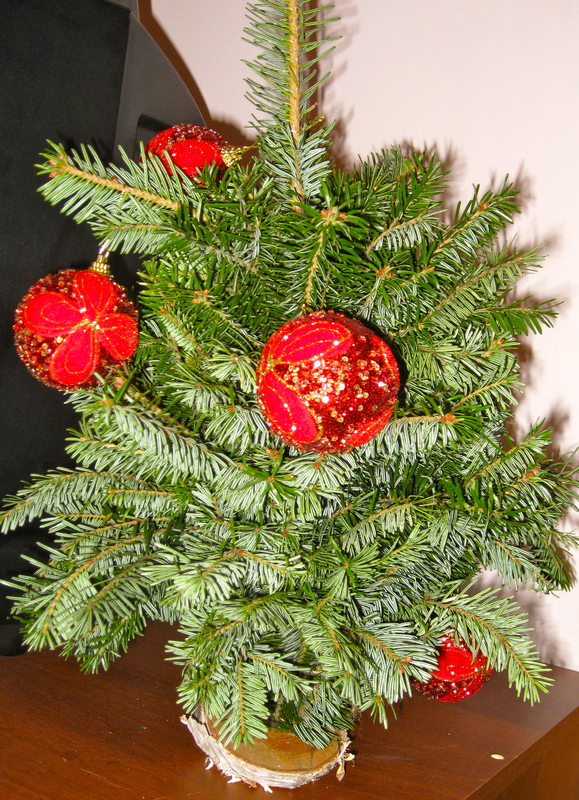 This entry was posted in celebrations/holidays, food, pictures and tagged Christmas on 27.12.2010 by taplatt. This baby tree is so cute! !